President Edgar Lungu has directed Labour Minister Joyce Simukoko to ensure that issues surrounding delayed payments of terminal benefits for the remaining retirees in the mining sector are resolved. 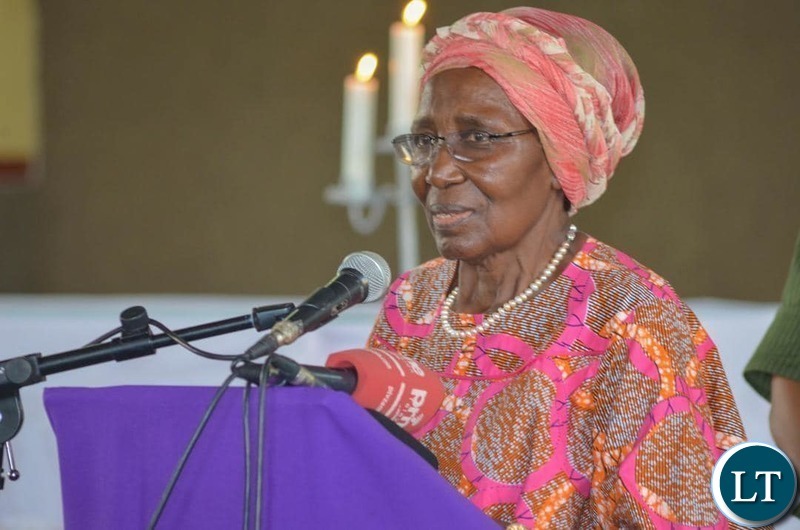 Vice President Inonge Wina disclosed this yesterday when she addressed a public rally in Roan constituency where she went to drum up support for PF candidate Joe Chibuye. The Vice President said Government wants outstanding issues pertaining to the well-being of the former miners addressed once and for all. And Mrs. Wina said Government has designed a program to empower retirees who want to engage in farming with land and inputs under the resettlement schemes. She said there is need to change the perception that resettlement schemes are meant for dumping former retirees. And Home Affairs Minister Stephen Kampyongo has rubbished reports attributed to NDC political consultant Chishimba Kambwili that the ruling party has allegedly removed ballot papers from the council to a private place. Mr. Kampyongo warned Mr. Kambwili to desist from tactics aimed at unnecessarily alarming the nation. And Chief Parliamentary Whip Steve Chungu said victory for the PF in the April 11 parliamentary by-elections is certain and guaranteed. Roan constituency has 35,277 registered voters. The seat fell vacant after Speaker of the National Assembly Dr. Patrick Matibini ruled that then MP Chishimba Kambwili had crossed the floor from PF to NDC. I hope she does the right thing. The president understand what is going on, on the ground. This will bring him more votes. Not that he needs them. If Ba Edgar has failed, how can Joyce pay those miners? Joyce can’t find any money. She knows nothing about money laundering. Nonsense. Where is the electoral commission surely. This is unacceptable. By the way what was Lungu’s PF’s manifesto when they got voted in 2016 or do they just inadvertently make things up as they go along? Mama Inonge, surely we cant be reminding Ministers of their core duties only when their is a need that threatens your jobs. Ministers, including yoursef are expected to be dping your work which the President has delegated to you whether there is an election or not, President Lungu is a very hard working man but most of you are too comfortable and have forgotten about your responsibilities of uplifting the welfare ofbthe citizens. PF is winning and retaining both seats in Roan and Bahati contituencies but letbthis give you the chance introspection in readiness for 2021. WE NEED ELECTIONS EVERYDAY FOR LUNGU TO WORK. One moron is directing contractors to get back to site as rains are gone another is directing so and so….what;s wrong with foooooools …they are like call boys at Kulima Tower Bus Station. Zamppost issue Will be sorted outed in 2021. That is to say around the time will be having presidential and general elections. For now with elections in Roan, the miners are what’s important. When are they going to open Post office. We sent our staff and mails can not be delivered. When is the post office going to start delivering out Parcels. No one can listen to this senile old grandma Bo Inonge…I mean who would take an old dog with no teeth seriously who is merely warming her chair for 2021 so she can retire to pasture!! Mr Ka saka Kadalama is working the pilots of his new Gulf Stream Jet into the ground ferrying sacks of kwachas between Roan and Bahati under the guise of inspecting developmental projects…really laughable…the fontini is now sleeping in the jet!! Holy man you will receive your parcels when there will be bye election at Zampost. Obviously you never wanted your parcel to be delivered otherwise you would have used DHL or FedEx.. .Zampost?? Only a fooooool would use them…Now those Zamposts chaps can steal with impunity…I mean which supervisor is going to ask an employee who has not been paid for 6 months why s/he is stealing!! President Lungu I like you, but this is the cheapest politicking I have seen in years. While you are at it find money for the civil servants that have been unpaid for months. Why do these ministers always have to give directives, these are adult civil servants and government employees you are talking to, not children. President Lungu needs new ministers, Kampyongo and Kambwili are one and the same Kaponyas. labour :we are still getting less money from these so called Chinese pipo & yet the she z jst sitting in her office without enforcing on this matter of getting low salaries. working for 12hours & at THE END of the month am still getting k900. please work on this Chinese pipo u are bring here in zambia. When is the order to pay Govt retirees going to be given?? What must we do for that order to come about??? Some of us knew Sata had no plan based on those funny unrealistic promises but somehow even educated people got duped. The same ones went further and voted for this clueless clown currently in state house. Please be objective when voting. A campaign song does not explain economic policy. You can imagine even people like Fred Mmembe supported Sata… I still shake my head to this day.